You’ve got to be comfortable on the job. Proper ergonomics help to reduce the risks of work injuries. A comprehensive ergonomic plan can help to reduce the risks of employees developing and suffering from MSDs or even Musculoskeletal Disorders. Still, there are a number of workplace hazards that are overlooked by employers. Just take a stroll through your work area and you can probably identify some of these risks. When employers don’t step in and take responsibility for reducing these risks, our Boston workers’ compensation attorneys are asking workers to step in and to help one another to stay safe on the job. -Keeping a clean workplace might be one of the most important safety measures that you can take to help to reduce the risks of injuries on the job. These are two of the best ways to prevent fires, too. It’s important to keep all walking areas free of debris and other obstacles. Make sure that the trash is taken out every day and that materials are never packed too high to prevent tip-over accidents. Make sure drawers and cabinets are kept closed at all times and that the filter system for your workplace is clean at all times. There are small moves that you can make to help to minimize, or completely eliminate, the risks for accidents. Even the “safest” of workplaces can still have serious risks if you’re not on the ball. -Make sure everyone is practicing good hygiene practices. Cold, the flu and even other diseases can easily spread to workers in an office when workers aren’t practicing good hygiene. Employees should always have the proper hand-washing stations equipped with bacterial soaps and single-use hand towels. Try posting these tips and regulations in an easily-seen area in the workplace. -You want to keep up with the maintenenace on the job, too. Make sure that the office building itself is clear of hazards. Floors should be smooth, electrical problems should be sorted out and structural concerns should be taken care of immediately. -You should make sure that all workers are properly trained in hazard awareness. This will help to make sure that any hazards that an employer may have missed is dealt with properly. -One of the most common work accidents are the slip, trip and fall accidents. You want to make sure that everyone cleans up spills and slippery floors immediately. 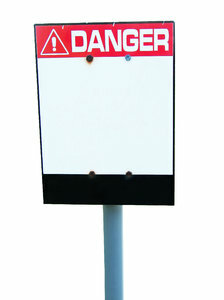 You should also consider posting signs in areas where water is known to accumulate. Be sure that all transitions between walking surface are smooth and are free of edges that could case a trip accident. You should also tuck away all loose cords that might be near the floor. Never string these cords through combustible materials either or underneath carpeting or rugs. The workers’ compensation lawyers here at the Law Offices of Jeffrey S. Glassman, LLC are here to offer free and confidential consultations to those who have been injured on the job. Call 1-877-617-5333.